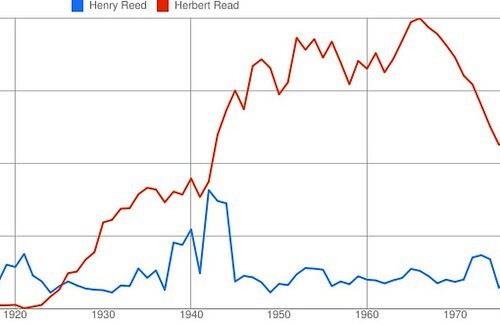 Here's a comparison of the frequency of published appearances of the names "Henry Reed" versus "Herbert Read," made possible by Google Books Ngram Viewer, which searches a corpus of 5.2 million texts published between 1500 and 2008approximately 500 billion words. 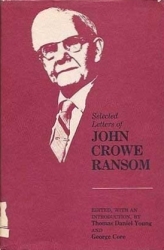 Notice where Henry nearly rivals his arch-nemesis in 1942, with the publishing of "Naming of Parts." You can read the announcement for the launch in the official Google Blog. It's interesting to see the difference in usage of the phrase "war poet" in American and British English, during World War I and World War II. (Is there a way to chart two corpora in the same graph?) Read more about the linguistic trends being discovered using the database in the New York Times.